The Super Yacht marina in the district area of San Giusto should be completed by the end of the year. 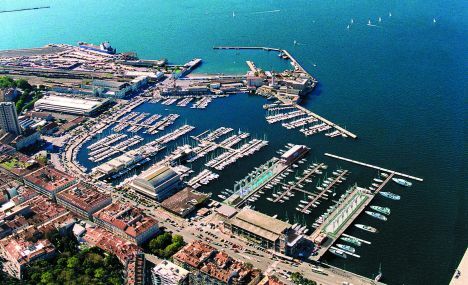 The 1.5 million Euro investment forsees 26 births for yachts between 25 and 40 meters that will moor just in front of the beautiful Piazza dell'Unità in Trieste. This will add a new "gem" to the gleaming necklace of the Adriatic's pleasure boat harbours, re-launching the capital of the Friuli Venezia Giulia region which, with adequate structures, will host an estimated annual transit of at least 250 super yachts. There is already, in summer, a similar flow from the neighbouring harbour in Venice since pleasure boaters in the eastern Mediterranean in their tour of the Adriatic discovered the increasingly attractive Dalmatia coast course. Now thanks to the City Council, harbour and maritime authorities the mega yacht port in San Giusto, is ready for launching. This will bestow upon the city of Trieste new opportunities of employment and of a renewed economy too, considering both the noticeable increase of new jobs created as a direct and indirect result of the spending potential of this particular type of "pleasure boater." Roberto Perocchio, president of the Italian Adriatic Association of Pleasure Boat Harbours which counts 50 marinas in between Trieste and Brindisi for a total of 25.000 moorings, is convinced of this. "The new San Giusto Marina can only but contribute to the upgrade of the city's waterfront which has already started by converting the old fish market, the wine cellars, the shoreline and the construction of an underground parking area for 3000 cars. Today, the Super Yacht port completes the project's uniqueness in as much as it represents a perfect attraction for an international tourism of prestige as it sets course for the Adriatic passing down the coast of France, Sardinia, Sicily and up to birth in Venice and Trieste. It's through this nautical circuit that Trieste with its new structures can consolidate such precious traffic which must be ensured since these yachts, worth millions of euros, spend in terms of consumption and maintenance a sum equal to 3 to 5% of their value" he concludes.